well, today is no different. i have more to share, and luckily for all of you...she is hosting a give-away. i want you to meet erin of easely erin. this girl is uber talented. i mean, like full of talent. i don't know if you recognize her name or not...but she is the brilliance behind my new logo (well, new about a year ago). she came up with the idea of that sweet little brown goose that you see on my logos. pure genius. well, not only is she a whiz in the graphics design department...but she also sews. and she makes some fine-looking stuff. i drool over her bags daily. i have known erin since elementary school. i knew her then as 'ubin spoon' a nickname that i still find myself calling her. we grew up in savannah together and found each other again through the wonderful world of facebook. she has become one of my good sewing buddies over time and i know that i can shoot her an email in the wee hours venting about some stupid thing my machines or doing or what-not. she is also a huge animal lover, which you all know how much i think that says about someone's character. but, it is now time for you to meet her. here you go. well, now on to the give-away fun! you see, she is so organized that it is all contained in one beautimus graphic. got that? like her on facebook, if you haven't already. here, she will post updates about the give-away and what all is at stake. but, you must make haste...the first give-away will be on WEDNESDAY!! i mean, i don't know about you...but i NEED that chickadee bag. for real. or maybe that is just the bag-lady in me talking. 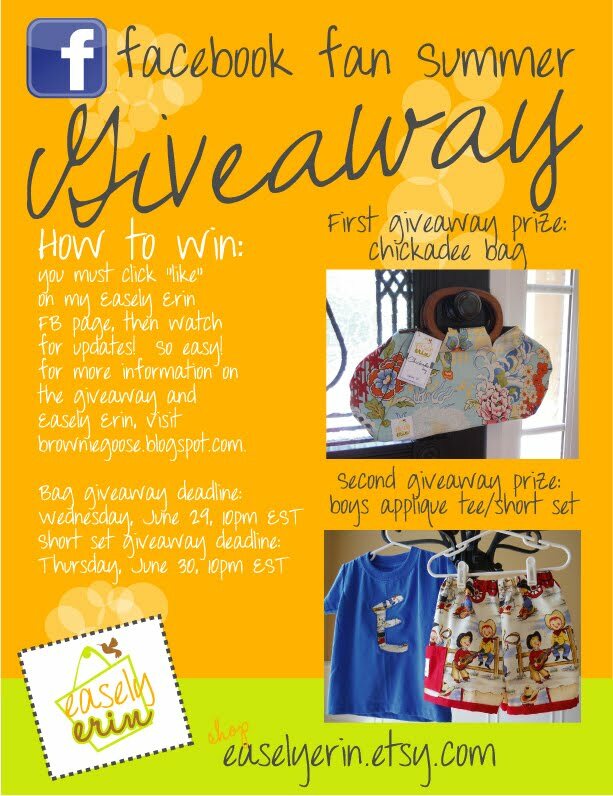 so, get on over to Easely Erin on facebook!! oh what can it mean. your welcome for getting it in your head. there is anther give-away going on. whoop, whoop! amanda jones is hosting a give-away that includes brownie-goose AND molly blossom. remember her? she is the awesome bag-maker and earring-maker that i featured earlier in the year. she is also doing some sew-alongs for those in the area, and just happens to have her hands on my milly pattern! check out her info for more details on the sew along. AND check out amanda's blog for give-away info! i am having some serious moments of pride here at BG! i keep getting photos that you awesome seamstresses out there send me of what you made with my patterns. this is an amazing feeling and it is so fun to see all of you put your own spins on it. man there are some talented folks out there! another proud moment i had was when i let my little lou be a seamstress for a day. check out what she did here on my blog. love that child. now, let's get down to supporting the mommas. being a stay-at-home-working-mom myself, i decided early in the game to make a sort of pledge to try my best to support other work at home moms when i can. for instance, i don't buy fabric wholesale. i could, and i could probably save myself at least $2-$3 a yard (which adds up quick considering my addiction) but i don't. instead, i head on over to etsy and hit up mommy-run fabric stores (like my most fave, HB Fabrics) and feed my fire. those extra few dollars don't really matter to me in the long-run since i know just that little bit helps that momma stay at home with her babies. something that i wish EVERY mom could do. i also try to promote mom-run businesses when i can. there are some crazy-talented moms out there that should be showcased! anyways, this basic reasoning is why i JUMPED at the opportunity that was presented to me by another talented mom, meagan of Made-By-Meagan. so, get your info in or get your shopping on! thanks again to meagan for the awesome idea!